A lawyer for Sarkozy could not immediately be reached for comment. The former president has dismissed the Libya allegations as "grotesque" and a "crude manipulation". France's centre-right party, The Republicans, backed its former leader. "Members and supporters of The Republicans are once again left feeling that not all lawmakers or former lawmakers are treated equally, depending on their political affiliation," the party said in a statement. France opened an inquiry into the Libya case in 2013, after reports by French website Mediapart based on claims by a Franco-Lebanese businessman, Ziad Takieddine, who said he had transferred 5 million euros (4.28 million pounds) from Gaddafi's former intelligence chief Abdullah Senussi to Sarkozy's campaign chief. 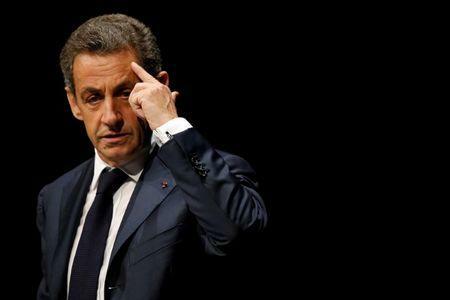 However, Sarkozy was later one of the chief advocates of a NATO-led military campaign that resulted in Gaddafi's overthrow and killing at the hands of rebel forces in 2011. The Libya-funding inquiry appeared to have gone quiet until January, when French businessman Alexandre Djouhri, suspected by investigators of funnelling money from Gaddafi to finance Sarkozy's campaign, was arrested in Britain on a warrant issued by France. A lawyer for Djouhri last month accused French authorities of politicising the case and manipulating it against his client. French authorities had no comment. The Libya inquiry has largely focussed on the evidence provided by Takieddine, who is himself under investigation in a separate affair of arms sales to Pakistan in the 1990s. Takieddine said in 2016 that he personally handed over three suitcases filled with cash from Gaddafi to Sarkozy and a senior aide to help finance Sarkozy's campaign. Sarkozy's lawyer at the time, Thierry Herzog, dismissed Takieddine's claims and produced a copy of a witness statement to police by Takieddine in 2012 in which the businessman said he had last seen Sarkozy in November 2003.